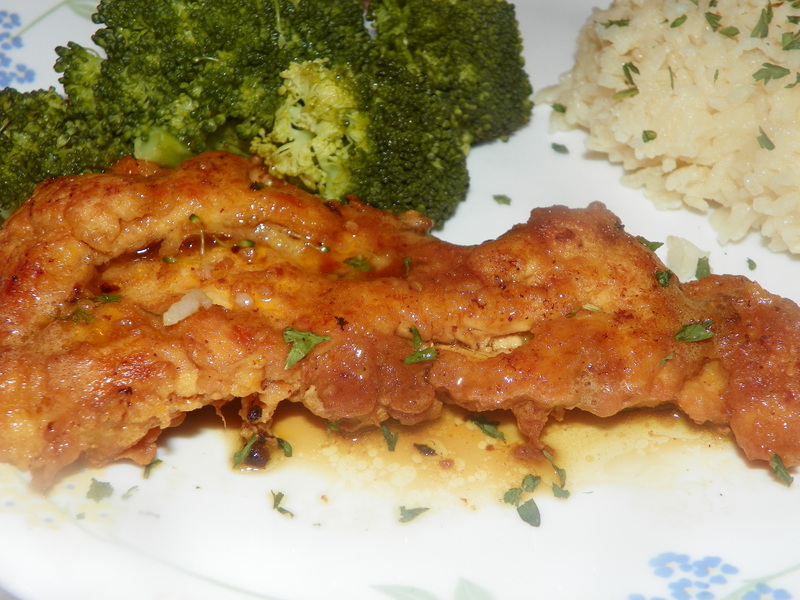 Chicken French – What's for Dinner Moms? While we are on vacation I hope you will enjoy some of our favorite dinners! This Chicken French recipe is really popular in our house. Chicken French is an a dish that is very popular in Rochester, New York. The dish which is a version of Veal or Chicken Francaise actually has its own version called “Rochester Style.” In Rochester you can have veal, chicken shrimp or artichoke French at most Italian restaurants and even a few non-Italian ones. We are celebrating Valentine’s Day with the kids and they like something different for the holidays. I decided to make this dish to remind them of home. My version of Chicken French started from this recipe at Food.com. This was perfect! Lemony, crunchy on the outside and super tender chicken on the inside. My version of Chicken French was not your typical Rochester, NY Chicken French. It was slightly tart but had a hint of lemon to it. This is definitely a recipe I will play around with some more but everyone loved it. To make if for my gluten-free son I dipped his chicken in Maize instead of flour and just cooked it all in a separate pan. His actually looked crisper. We served the dish with rice cooked in chicken stock and broccoli as sides. Mix together eggs, cheese and parsley on a plate. On a second plate mix together flour, salt and pepper. Between two sheets of plastic wrap, pound chicken thin to about 1/4 to 1/2 inch thickness. Dredge chicken in flour mixture, then dip in beaten egg mixture. Fry in olive oil until brown on both sides about 5 minutes per side. In same skillet, saute garlic lightly, then add wine and bring to boil. Lastly, stir in butter until melted. Add chicken back to pan and bring to boil. Simmer for about 5-10 minutes. Remove chicken from the pan and sprinkle with parsley before serving. Next Post Meet & Greet! Thank you! Just pinned your green bean recipe to try soon! I’ve got Boeuf Bourguignon in the slow cooker. I’m sure that will be a future blog post! I think you’re already following my blog, so you should see that. I have weak spot for lemon chicken, so yours sounded really good! I do follow but I will check it out! Pingback: On the Road Again, IV – What's for Dinner Moms?